A mofetta is a carbonic gas emanation from lava cooling below the earth. Very spectacular, there are only 3 in Europe: the dog cave in Pouzzoles near Naples, Royat (Puy de Dome) and Neyrac. The Echelle du Roi is a natural rift in the basalt flow. Vista on the giant’s causeway with amazing views over Pont du Diable. Steep footpath to Pont du Diable. Located at Neyrac spa, this is an explosion crater. Volcanoes of this type happen when very hot magma at 1,200C° (lava) meets water several hundred meters below the earth. 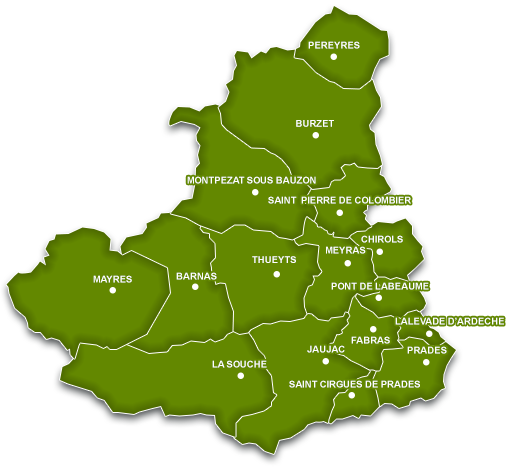 The volcanoes in the commune of Meyras are part of the Young Volcanoes of Ardèche. The Souilhol volcano and its two flows as well as the Maar Doris were thrown up during the last eruptive episode affecting the Bas Vivarais. Experience the Ray Pic waterfalls where water from La Bourges river bursts through basalt rock. This natural volcanic site has been listed since 1931. It’s worth walking the 215 steps for the views of the Vernède plain. A famous columnar blue basalt flow forming prisms. On the banks of the Lignon, this gigantic flow seems to want to submerge us, creating impressive gorges looking like organ pipes. It is said to be the most beautiful in Europe. Famous causeways and columns with blue basalt prisms. On the banks of the Lignon, this gigantic flow seems to want to drown us creating impressive gorges looking like organ pipes. It is said to be the most beautiful in Europe. A large stone field below the Mont Aigu, on the North face. Clapas means a build up of broken rock or scree. At the bottom of volcano the Peschier mineral spring was formerly very popular. You can still enjoy its clear, semi-sparkling, ferruginous water on the spot. Basalt causeway resulting from the Gravenne de Thueyts volcanic eruption. You can see this on your way to the volcano. This magic place is less and less secret. It is composed of two ponds of approximately 800 sq.m. in area. The site, a marsh fed with sources from the Volcano attracts dragonflies. The Pont de Labeaume site, virtually where three valleys join, presents a major geological attraction in a small area: the morphology of the valleys is easy to understand by the superposition of basaltic flows. The name of the Bowl of Jaujac is due to its shape which apparently looks like a drinking bowl. “It is one of the most regular Volcanoes in France, even the most perfect” (Brousse & Berger, 1967, p.3). Come and discover the Cocalière, one of France’s greatest caves, and set off on a wonderfull journey to the center of the Earth, between Gard and Ardèche.